Avid birders and novices alike will unite in Picabo on Sunday as part of a 112-year bird counting tradition. Since 1900, birdwatchers across the nation have joined together to count both individual birds and bird species in carefully designated areas across the Western Hemisphere. Known as the Christmas Bird Count, the program is a winter bird census organized by the Audubon Society and conducted by citizen birdwatchers nationwide. "All it is is a big treasure hunt," said Brian Sturges, a Wood River Middle School math and science teacher who has been running the Picabo bird count since 1974. "It's always fun, because we always run into something surprising." Sturges said that while all birds are counted, watchers are always on the lookout for anything rare and unusual. About 50 to 60 bird species are spotted each year in the area around Carey, including owls, hawks, mallard ducks and songbirds. But rarer birds sometimes stop by, Sturges said. "One year, we were high in the nation for gray-crowned rosy finches," he said. "They are very localized in winter, and there are just certain areas that get them." This brown and pink finch is a native of Alaska, but migrates down to Idaho to wait out the winter months. The finch generally nests at elevations of 10,000 feet, but Sturges said there is a flock that makes its winter home at the top of Queen's Crown near Carey, with frequent trips to the nearby dump and fields. Mark Delwiche, president of the Snake River Audubon chapter, said his group near Craters of the Moon National Monument saw several unusual birds during its count on Wednesday. Though the group saw nearly 100 goldfinches, Delwiche said he was most surprised by the spotting of an American dipper, a small brown aquatic songbird that nests behind waterfalls. "I don't think we've had a dipper on that count in five years," he said. "They are pretty remarkable in that they live right in the water. They don't swim, but they typically are by cold, running streams and will walk right into and right under the water." Sturges said he would also be on the lookout for redpolls or hoary redpolls, another Alaskan species of finch. The birds only rarely visit the valley, but Sturges said he has seen a few already. Migratory bird populations seem to be holding steady in the area, Sturges said, though duck populations have continued to decline. Perhaps the most stunning change is the increase of a new kind of pigeon, the Eurasian collared dove. "I drove over to American Falls in 1999 to see one," Sturges said. "It was a big deal. Now you can go to Carey and there is a roost of over 100. They have just spread all over the place, and no one is quite sure what impact they are having." The Picabo birdwatching crew will meet at the Picabo General Store at 7:30 a.m. on Sunday before splitting off into groups assigned to different sections of the group's assigned area. Sturges said he typically gets 12 to 15 volunteers, and each group is assigned an expert bird-watcher to help with identification. 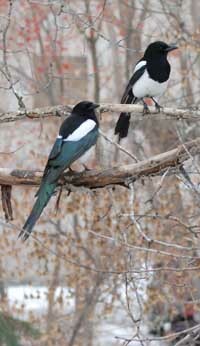 "There are definitely birders who are world-class birders in our area," he said. Sturges said those preparing to come count birds should dress warmly and bring a large thermos of hot coffee, as temperatures and wind chills can dip into the single digits. "I've had people come out here before who think it's a bird walk and show up in jeans and a sweater," he said. "[Watchers should] be prepared for an all-day science outing." The count goes from dawn to dusk. Participants should bring a camera, binoculars, snacks or a picnic lunch and a $5 registration fee, which goes to the Audubon Society. Any questions should be directed to Sturges at 578-0219. But above all, Delwiche said, participants should be prepared for surprises. "It's like an Easter egg hunt," he said. "You never know what you're going to find or where you're going to find it."